Find out what you need to know to offer easy access to folks using a wheelchair or mobility scooter. Opening your heart and home to a mobility-challenged loved one is a beautiful thing. And one way to make it easier on everyone is with a wheelchair ramp that leads straight to your door. But before you DIY or hire a builder to construct one, learn the basics on rules, safety, and materials so that comings and goings will be as smooth as possible. Check in with both the Americans with Disabilities Act (ADA) and local authorities as your first step. 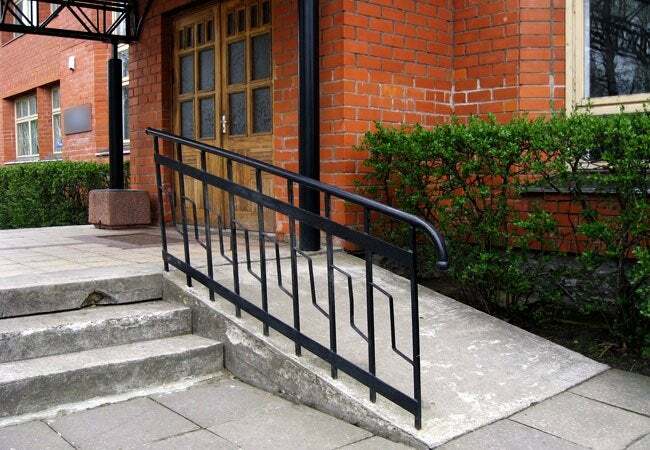 You’ll probably need to obtain a permit to install a ramp from your local building authority. It may also be necessary for you to comply with ADA standards. Not all states or communities enforce ADA standards for residential ramps, but following its guidelines will ensure that your ramp is wheelchair user safe. While the ADA states that ramps must be a minimum of 36 inches wide, check local building codes, too, because some states enforce wider ramp widths. Also note that any ramp that rises more than 6 inches in height must also have 36-inch high handrails on both sides for safety. The ADA requires a ramp rise, in height, not more than 1 inch per every 12 inches of run, written as a 1:12 slope. For example, if you need a ramp to reach a 30-inch high porch, you’ll need a minimum of 30 lineal feet for the ramp. Those lacking adequate lineal space can design a ramp with turns or switchbacks. But at every turn, the ADA requires a minimum 60-inch-by-60-inch level landing as a wheelchair rest. 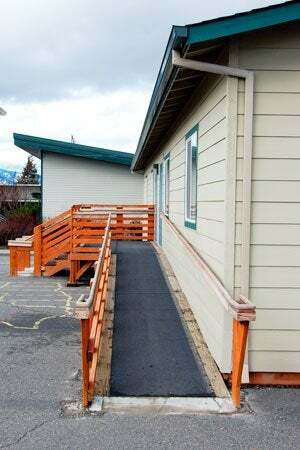 The ADA also requires a minimum 60-inch-by-60-inch landing at the bottom and at the top of the ramp. A ramp cannot begin to slope right outside the door; a level landing on the porch is necessary. No ramp should rise above 30 inches without a level landing. For example, if your porch is 48 inches high, you’ll need 48 feet of lineal ramp and a 60-inch-by-60-inch landing somewhere along the ramp before it rises 30 inches. On a straight ramp, this could be accomplished by building a landing off to one side; on a switchback ramp, the landing could be at the turn. If you aren’t mandated to follow ADA rules, this particular guideline is less important for a person with a power chair, yet for someone operating a wheelchair by hand, a resting spot is essential. Wood is most commonly used in residential ramp construction, but it’s not your only option. • Wood: With basic carpentry knowledge you can DIY a wood ramp. You’ll sink support posts of approximately 30 inches into the ground and secure them with concrete. Treated wood is popular for wheelchair ramps, but composite planking for the floor may reduce warping. All wood surfaces should be sealed, and it’s wise to put non-skid strips on the floor planks to avoid slippery-when-wet conditions. You can also put indoor/outdoor carpet on the ramp floor. For extra durability, consider installing metal handrails; wood handrails have a tendency to splinter after a few seasons. • Concrete: Framing and pouring concrete is a technical undertaking, and wet concrete isn’t forgiving of mistakes, so concrete ramps are best constructed by a pro. Concrete ramps require footings and stem walls, and are typically filled with compacted sand before they are poured. Reasons to go with concrete include permanence and durability; you can even embed heat strips to prevent ice buildup in winter. Concrete is also a good choice for a ramp rise of only a few inches. If pedestrians will be using a low-rise ramp, go with a gentler, 1:18 slope, which makes walking more comfortable. • Earth-berm: For aesthetic appeal, an earth-berm ramp can be worked into your landscape to look like meandering path that slowly rises to the porch. But this type of ramp requires compacting a lot of soil to build the berm (the ramp itself should be poured concrete). And while you can lay berm soil against masonry, such as a concrete or brick porch, soil should not come into contact with wood due to the risk of rot and termite infestation. • Premade ramps: For a quick fix—or if you have difficulty obtaining a permit to build a wood or concrete ramp—a premade wheelchair ramp could be a smart solution. 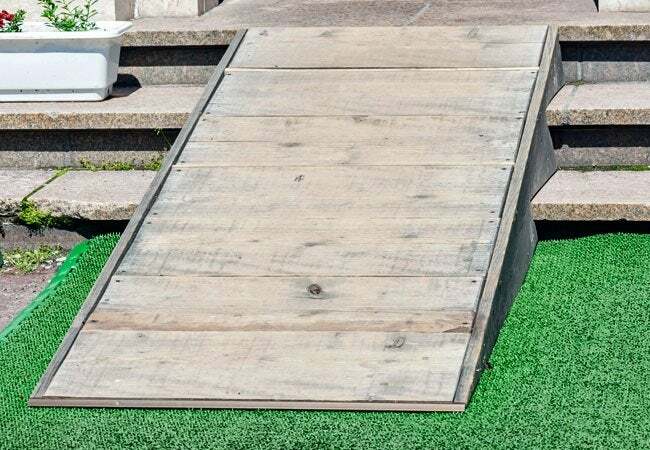 Premade ramps are typically removable, so they’re considered “private property” rather than “real estate,” and therefore not subject to building codes. Generally fabricated from aluminum or galvanized metal and designed to fit over existing steps, they start at a few hundred dollars for bare-bones models but could run into the thousands for higher quality and custom designs.